Helen Kotas Hirsch was another product of Louis Dufresne the Belgian immigrant player and teacher whose Chicago studio turned out the hornplaying elite: Kotas, Farkas, Brouk, etc. Helen Kotas played in the usual student orchestras in Chicago, but blasted into instant fame by playing first horn in Leopold Stokowski's All-American Youth Orchestra which toured South America. The other players completeing the section: James Chambers, Mason Jones, and Ernani Angelucci, players with whom we are very well acquainted by their ensuing fame resulting from their affiliations in orchestras in NY, Philadelphia, and Cleveland. Helen Kotas later played a grueling audition for Reiner for the 3rd horn job in Pittsburg, and after playing there a short while, played an audition for Frederick Stock to win the 1st horn post in Chicago. It is generally held as fact, that she was the first woman to hold such a post. There have been many claims made lately, regarding who was the first woman to hold such a post, with more than a few embarrassed and disappointed claimants; as far as I know, Helen still holds the record. Now, by now, I hardly need to underscore the history of unfairness we Americans have, regarding anyone who was not white and male in our country. There is a great deal about which we may, correctly, feel great remorse, and Helen Kotas' story contains a classic episode. Following Helen's very successful years with Stock, there were some equally brilliant years with the Belgian conductor Desire DeFauw, during which some outstanding recordings at 78 RPM were made, including Gli Ucelli by Resphigi, with its beautiful nightingale horn solo, and the Water Music by Handel, featuring the stunning tone of Helen on her Geyer double. Both recordings reveal Kotas' colorful and ringing sound as well as her accuracy and reliability (there were no retakes in those days). Then came Rodzinski. R: "I'd like to introduce you to Mr Farkas, who is the orchestra's new first hornplayer. You'll be assistant to him." K: "Hello Phil. Dr Rodzinski, Mr Farkas and I are old friends, we studied with the same teacher, Louis DuFresne, and with all due respect and admiration for Mr Farkas' work, I'm not sure at this point in my life, that I wish to play assistant to anyone." R: "Then don't. You will sit in the front of the auditorium where I can see you, during every rehearsal and concert during this, your last, season with the Chicago Symphony." And that is how she ended her tenure (if the word can be used in context with the weak contract they had in those days) with the Chicago Symphony. By all accounts her work was phenomenal, and there could have been no artistic reason for her dismissal. Her grace under stress, as revealed by this account from Elmer Janes, a close friend from childhood, is remarkable. Farkas was documentably saddened by the turn of events, but understood and supported Helen's decision. Musicians had very little clout in those days. Well, where do you go from the Chicago Symphony? Helen Kotas went to the Lyric Opera as first horn and the Grant Park Symphony as well. She returned to school and got her Masters degree in psychology as well (probably trying to figure out Rodzinski). During this period she married Dr Edwin Hirsch, a well known physician. Her study on the horn continued by focusing on the instrument's solo literature, which had begun to expand after the war through the composition of new works, and the scholarly efforts in the archives in europe, yielding lost treasures for our instrument. Helen was later to expose her students to this literature, unknown to most other player/teachers. At the same time, Mrs Kotas-Hirsch increased her availability as a teacher at the American Conservatory, where I had the good fortune to study with her. Her wide range of experiences, and her high intellegence made her an exceptional teacher, and the best part of my repertoire as a solo player, I learned from her during two years there. The weight of nine different international competitions and awards, I will lay as a credit to her inspired teaching of this solo literature. Other pupils of hers include Randall Faust and the late Robert Wirth. I know that there are other pupils of Helens who have distinguished themselves; I regret that I have no list. There were compositions by Oldberg and Kauder, among others, written for her. She never made any commercial recordings of her playing,( the recording industry was in its infancy), but by means of archival and broadcast recordings, Lisa Cigneros, with the assistance of Jack Riddle, has produced a two CD set of Helen Kotas playing, both as soloist and as an orchestral first horn. The email address to procure a copy of the CD is tchaik4@a... It is a remarkable document. I am presently, with the enthusiastic support of Randall Faust, about to try to influence the powers that be, to consider Helen Kotas Hirsch for honorary membership in the IHS. As I pointed out in an eulogistic reading presented at her memorial, apart from valor in combat, we are not a nation of decorators, even when feeling earnest admiration for our artistic heroes. In England she might have been Dame Helen, in Russia, her garments would have been weighed down with medallions and decorations from some People's Cultural Commitees. She certainly merited an honorary Doctorate from academia or a Life Time Achievement Award from a group of her peers. So far, except from her students, she has been ignored by the organizations who claim to concern themselves with such issues. 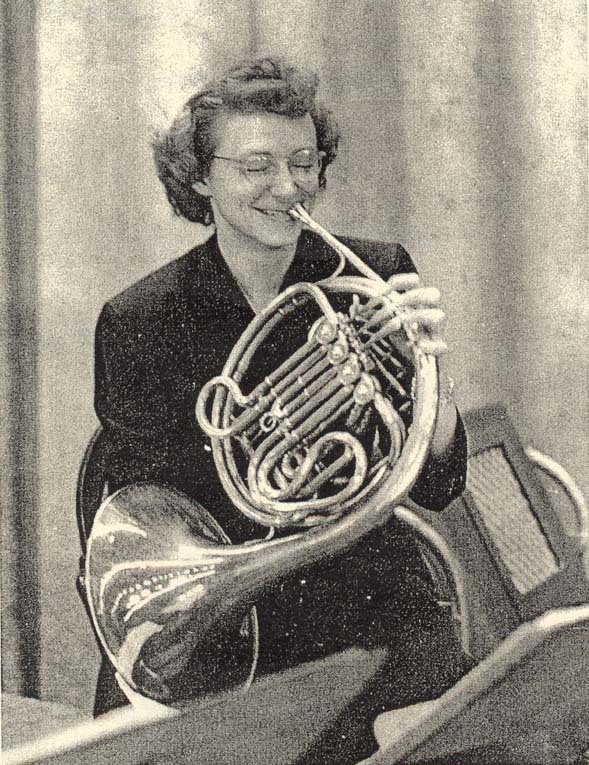 My question is, How do we, or other members of the horn community, proceed to honor our contemporary colleagues, especially the women of note (no pun), when we continue to ignore Helen Kotas Hirsch? Aren't we cheapening the honors for, say, Gail Williams, or Froydis Wekre, when we (criminally) neglect the achievements of Helen Kotas Hirsch? How long will we continue to validate a questionable decision made by a, by now, almost forgotten conductor, a long time ago?